30.04.10 - Lucid Lynx, coming soon to a server near you. If you can't wait, you can get the beta. 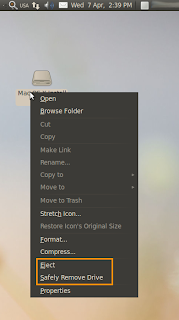 Window close, minimize, maximize buttons are on the left! Last time I checked, Ubuntu wasn't Apple's official distribution, so why is it trying to act like one? Solution: System > Preferences > Theme > Customize. I had the idea that Gnome was simple, however take a look at the context menu for a USB flash disk; there are 16 options displayed and many of them are grayed out as they probably don't even apply. Unavailable options should be invisible and Format and Compress can be easily put in Properties window. If that wasn't enough to cause confusion, the user gets two choices for the USB stick removal: Eject and Safely Remove Drive. Isn't Eject safe enough? Why not just have one option of Safely Remove Drive? ......will be updaed later though.